The news of Pope Benedict XVI's resignation brings to mind an image from our rare book collection that illustrates a previous papal resignation, that of Pope Celestine V. Celestine appears together with his successor, Boniface VIII, in an image at the opening of a 1514 edition of the Liber Sextus: Sextus decretalium liber a Bonifacio. viij. in concilio Lugdunensi editus (Venice: Luca Antonio Giunta, 1514). The Liber Sextus formed part of the Corpus Juris Canonici ("The Body of Canon Law") that served as the foundation of canon law in the Catholic Church from the Middle Ages until 1917. It is unsurprising to find images of Boniface VIII at the opening of the Liber Sextus, since he is the pope who ordered its compilation. It is surprising to find such unflattering images. 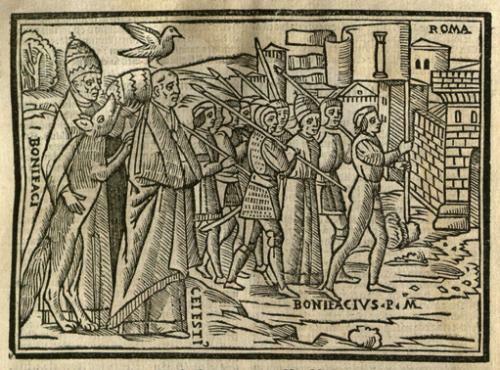 The woodcut depicts two scenes from Boniface's life. In the foreground, Boniface embraces a fox who pulls the papal tiara from the head of his predecessor, Celestine V. A dove over Celestine's head symbolizes the Holy Spirit conferring its blessing upon Celestine. In essence, the image repeats the accusation that Boniface tricked the saintly Celestine into resigning. Celestine V had been a monk renowned for his piety and asceticism, who founded a strict branch of the Benedictines. A divided College of Cardinals elected him in July 1294 after having failed for over two years to elect one of their own. The new pope accepted his election reluctantly, and soon concluded that he was unfit and unwilling to continue to serve as pope. Some sources say Celestine's decision to resign was his alone, while others say Cardinal Benedetto Gaetani, the future Boniface VIII, goaded and tricked him into resigning. All agree that Boniface drafted the papal constitution authorizing a pope's resignation. Boniface was elected pope immediately afterward, in December 1294. Celestine tried to return to a hermit's life, but he died as Boniface's prisoner in 1296. Celestine was canonized in 1313. Interestingly, Pope Benedict XVI visited Celestine's remains in 2009, after they had survived the L'Aquila earthquake (see photos here). He proclaimed the Celestine Year from 28 August 2009 to 28 August 2010, to mark the 800th anniversary of Celestine's birth. On the right of the image shown here is a scene from the end of Boniface VIII's papacy, in 1303. He was taken prisoner by the powerful Colonna clan of Rome, with whom Boniface carried on a bitter and bloody feud. The Colonnas and their ally, King Philip IV of France, demanded Boniface's resignation, to which Boniface replied that he would "sooner die." His wish was granted a few days later. It was Philip IV who later nominated Celestine V for sainthood. Both Boniface and Celestine make appearances in Dante Alighieri's Divine Comedy. Dante places Boniface in the eighth circle of Hell, reserved for those guilty of simony. Dante's exile from Florence was a direct result of Boniface VIII's political machinations, and Boniface was "Dante's most reviled theological, political, and personal enemy" (Danteworlds website, University of Texas at Austin). Celestine V is believed to be the coward beside the gate of Hell who made "the great refusal" by abdicating the papacy and paving the way for Boniface's election as pope. For citations to scholarly writings on papal resignations in the Middle Ages, see "The first papal abdication since six centuries", a posting in the excellent Rechtsgeschiedenis Blog, "Legal history with a Dutch view." The Wikipedia articles on Celestine V and Boniface VIII provide additional details and links to additional sources. In Connecticut and elsewhere, instructors in the proprietary schools played a crucial and self-conscious role in the Americanization of the common law. Applying practical experience, political beliefs, and the ideology of the American Revolution, they revised it to suit local circumstances and showed where it was incorrect, obsolete, or irrelevant. This is especially evident in their reception of Blackstone’s Commentaries. On a fundamental level they helped to de-Anglicize the law by teaching the positive and case law of their state. Instructors in the Connecticut schools played a dominant role in this process, training dozens of men who became influential lawyers, judges, legislators, and teachers. Litchfield’s alumni list, our largest and most distinguished example, includes two vice-presidents, 101 United States congressmen, twenty-eight United States senators, six cabinet members, three United States Supreme Court justices, fourteen governors, thirteen chief justices of state supreme courts, and seventeen members of the Connecticut House of Representatives. Reeve, Gould, and Swift’s widely circulated treatises, all published versions of their lectures, were equally influential. Benjamin Pomeroy (1787-1855), Manuscript notes of lectures by Sylvester Gilbert at his Law School in Hebron, Connecticut (c. 1811). [Image cropped.] Rare Book Collection, Lillian Goldman Law Library. Instructors in the Connecticut schools rejected Blackstone’s unquestioned reverence for the common law. As we see in this lecture by Gilbert, they often subjected his doctrines to counterexamples drawn from natural, civil, and Roman law. Tapping Reeve, The Law of Baron and Femme (New-Haven: Oliver Steele, 1816). [Image cropped.] Ownership signature of Isaac Leavenworth (1791-1864), a student at the New Haven Law School in 1822. Rare Book Collection, Lillian Goldman Law Library. The first American treatise on family law, Reeve’s Law of Baron and Femme is a restatement of Blackstone’s Commentaries, Book I, Chapters XIV-XVII. It rejects some of the fundamental doctrines of the common law, most notably coverture. As Blackstone puts it, “the husband and wife are one person in law; that is, the very being or legal existence of the woman is suspended during marriage.” Reeve says the opposite. Also a prescriptive work, Baron and Femme aimed to liberalize the American law of domestic relations, arguing, for example, that married women were permitted to make wills, a point contradicted by the contemporary statute and case law of Connecticut and several other states. Zephaniah Swift, A Digest of the Laws of the State of Connecticut (New-Haven: Printed and published by S. Converse, 1822-1823). [Image cropped.] Rare Book Collection, Lillian Goldman Law Library. Zephaniah Swift’s System of the Laws of the State of Connecticut, the first original American legal treatise, was highly regarded throughout the United States. Published on a subscription basis, its subscribers included George Washington, John Adams, Aaron Burr, James Kent, James Madison and other notables. Structured in the manner of Blackstone’s Commentaries, it presented an overview of the common law of Connecticut, and the common law generally, based on local court decisions and legislation. Swift’s Digest, a more ambitious work, is a complete recasting of the Commentaries. Though it referred to Connecticut law, the Digest addressed American law generally and was intended for a national audience. Both works were deeply influential and are still cited today. “From Litchfield to Yale: Law Schools in Connecticut, 1782-1843,” curated by Michael von der Linn and Michael Widener, is on display through May 30, 2013, in the Rare Book Exhibition Gallery, Level L2, Lillian Goldman Law Library, Yale Law School. A handful of college and college-affiliated law schools existed in the early decades of the nineteenth century. The College of William & Mary established a law department in 1790, which granted America’s first LL.B. in 1793. Others schools followed, such as Transylvania University (1799-1861), Harvard University (1817), and the University of Virginia (1826). Although some have proposed earlier dates, it is generally agreed that the New Haven Law School was joined to Yale College in 1826. Existing records do not explain the reasons for this union, but we can point to a few possibilities. In the early nineteenth century American colleges were beginning to evolve into universities by establishing or acquiring professional schools. Elite lawyers, many of them members of college corporations, encouraged the creation of college-based law schools. Finally, the New Haven Law School was an attractive bargain; it was a successful, self-financed, self-managed school with a fine library and a distinguished faculty. And it was available to Yale for nothing more than the prestige conferred by its name. On their part, Hitchcock and Daggett probably viewed their school’s union with their prestigious alma mater as a way to raise its profile and compete with other prestigious schools, Harvard especially. Catalogue of the Officers and Students in Yale College (Nov. 1826). [Image cropped.] Rare Book Collection, Lillian Goldman Law Library. Yale’s 1826 Catalogue marked the re-birth of the New Haven Law School as Yale Law School, a peer institution of the “Theological Department,” founded in 1822, and the “Medical Institution,” founded in 1813. Daggett was appointed to the Yale College faculty as “Professor of Law” in 1826, another factor that joined the two schools. He was granted an LL.D the same year. Hitchcock received a courtesy title of instructor in the college in 1830 and an LL.D in 1842. Aholiab Johnson (1799-1893), Account book, 1825-1840. Rare Book Collection, Lillian Goldman Law Library. Gift of Lois S. Montbertrand, Law ’85. Samuel J. Hitchcock, letter to Yale Corporation requesting permission to grant LL.B., 1842 Aug. 6. Yale University Corporation Records (RU 164, Accession 1993-A-083: box 2, folder 2). Courtesy Manuscripts & Archives, Yale University Library. Hitchcock offers two reasons why Yale should confer the LL.B. : it would enable the law school to compete with other degree-conferring schools, especially Harvard, and it would “raise the standard of attainments” and “moral conduct” of the students. His second point reflects a larger effort among elite lawyers to expand the scope of legal education beyond preparation for the bar exam, which was the sole purpose of the proprietary schools. Yale College Law School [circular]. New Haven, 1843 Sept. 1. [Image cropped.] Yale Law School Records (RU 449, Accession 1939-A-001: box 1, folder 6). Courtesy Manuscripts & Archives, Yale University Library. Intended for enrolled and prospective students, the 1843 circular describes requirements for the LL.B. This text was also published as an advertisement in several nationally circulated journals. The law school’s enrollments increased after 1826, but it drew even more students after it became a degree-granting institution. By 1865 it had trained students from 31 states and territories and six foreign countries. Affiliation with Yale helped to insure the continuity of Hitchcock and Daggett’s school. The others did not survive. Gilbert closed his school in Hebron around 1818. We’re not sure why, but he was probably responding to a combination of professional obligations, including his term in the U.S. Congress in 1818-1820, and advancing age. The Windham school ended with Swift’s death in 1823; ill health and declining enrollments led Gould to close the Litchfield Law School in 1833. From then, Yale remained the only law school in the state until the establishment of the University of Connecticut Law School in 1921. 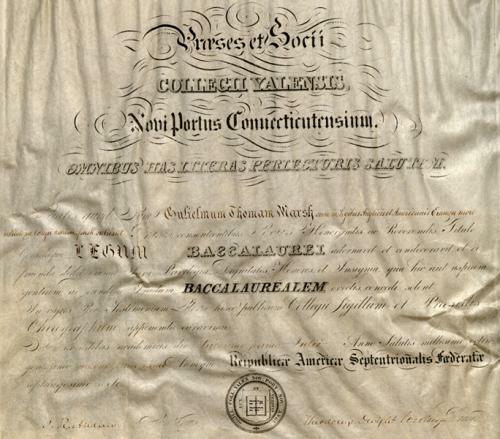 Yale College diploma, 1852 July 1, awarding William Thomas Marsh the degree of Bachelor of Laws. [Image cropped.] Rare Book Collection, Lillian Goldman Law Library. An early example of a Yale Law School diploma. A North Carolinian, William T. Marsh (1830-1862) graduated with honors, returned home, and became a distinguished member of the North Carolina bar. In 1860 he represented Beaufort County in the state House of Representatives. Though he opposed secession, he chose to serve his state when it joined the Confederacy. In 1861 he became an officer in a local militia regiment, the Pamlico Rifles, and was fatally wounded during the Battle of Antietam. "From Litchfield to Yale: Law Schools in Connecticut, 1782-1843," curated by Michael von der Linn and Michael Widener, is on display through May 30, 2013, in the Rare Book Exhibition Gallery, Level L2, Lillian Goldman Law Library, Yale Law School. Baldwin, Simeon E. “Zephaniah Swift.” In Great American Lawyers (William Draper Lewis; ed. ; Philadelphia: John C. Winston Company, 1907-1909). Fisher, Samuel H. Litchfield Law School 1774-1833: Biographical Catalogue of Students. Yale Law Library Publications, no. 11. New Haven: Yale University Press, 1946. Forgeus, Elizabeth. “An Early Connecticut Law School: Sylvester Gilbert’s School at Hebron.” 35 Law Library Journal 200-203 (1942). Forgeus, Elizabeth. “Sylvester Gilbert’s Law School at Hebron, Connecticut: The Students.” 39 Law Library Journal 49-52 (1946). Hicks, Frederick C. Yale Law School: The Founders and the Founders’ Collection. Yale Law Library Publications, no. 1. New Haven: Yale University Press, 1935. Hoeflich, Michael H. Legal Publishing in Antebellum America. Cambridge: Cambridge University Press, 2010. Klafter, Craig Evan. Reason Over Precedents: Origins of American Legal Thought. Westport, CT: Greenwood Press, 1993. Klafter, Craig Evan. “The Americanization of Blackstone’s Commentaries.” In Essays on English Law and the American Experience (Elisabeth A. Cawthon & David E. Narrett, eds. ; College Station: Texas A&M University Press, 1994). Langbein, John H. “Blackstone, Litchfield, and Yale: The Founding of Yale Law School.” In A History of the Yale Law School: The Tercentennial Lectures (Anthony T. Kronman, ed. ; New Haven: Yale University Press, 2004). Langbein, John H. “Law School in a University: Yale’s Distinctive Path in the Later Nineteenth Century.” In A History of the Yale Law School: The Tercentennial Lectures (Anthony T. Kronman, ed. ; New Haven: Yale University Press, 2004). The Litchfield Ledger, <http://www.litchfieldhistoricalsociety.org/ledger>. A biographical database of students at the Litchfield Law School and Litchfield Female Academy, provided by the Litchfield Historical Society. McKenna, Marian C. Tapping Reeve and the Litchfield Law School. New York: Oceana, 1986. Reed, Alfred Zantzigner. Training for the Public Profession of the Law: Historical Development and Principal Contemporary Problems of Legal Education in the United States, with Some Account of Conditions in England and Canada. New York: Charles Scribners’s Sons, 1921. White, G. Edward. “Law and Entrepreneurship.” In White, Law in American History, Volume 1: From the Colonial Years Through the Civil War (New York: Oxford University Press, 2012). The image: Zephaniah Swift, A System of the Laws of the State of Connecticut, vol. 1 (Windham: Printed by John Byrne, for the author, 1795-1796). Ownership signature of Samuel W. Southmayd (1773-1813), a student at the Litchfield Law School in 1793. Rare Book Collection, Lillian Goldman Law Library. We sincerely thank the following individuals for their help in making this exhibit possible. The image: Catalogue of the Litchfield Law School, from 1793 to 1827 inclusive (Litchfield, Conn.: S. S. Smith, 1828). Rare Book Collection, Lillian Goldman Law Library. Until the end of the nineteenth century most students prepared for the bar through an apprenticeship or self-study. These methods were often criticized by elite lawyers, who believed legal education would be more rigorous and thorough if it was taught in a classroom. By the late-eighteenth century a few colleges offered law lectures, beginning in 1779 with the College of William and Mary, but these lectures were designed not to train lawyers, but rather to educate future political leaders and businessmen. Vocational legal education in America began with Tapping Reeve’s establishment of the Litchfield Law School in 1784. The success of Reeve’s program, and its perceived value, inspired the establishment of three other schools in Connecticut: Seth Staples’s in New Haven, Zephaniah Swift’s in Windham, and Sylvester Gilbert’s in Hebron. Into the second decade of the nineteenth century Connecticut had more law schools than any other state in the union. Their proprietors had similar backgrounds. Born into comfortable circumstances, they were mostly graduates of Yale College, who became some of Connecticut’s leading attorneys. Their ability at the bar brought them wealth, fame, and high social status. They tended to be politically and socially conservative. Civic-minded and active in politics, they were involved in public service as legislators, judges, and local officials. (1) Litchfield Law School. Years of operation: 1782-1833. Proprietor: Tapping Reeve, 1782-1820, James Gould, 1820-1833. Instructor: James Gould, 1798-1820. Number of students: 1,000+. (2) New Haven Law School. Years of operation: c.1800-1826. Proprietor: Seth Staples, c.1800-1824, Samuel Hitchcock, 1824-1826. Instructor: Samuel Hitchcock, 1820-1824, David Daggett, 1824-1826. Number of students: 67+ (lists of students prior to 1819 are unknown). (3) Gilbert’s Law School, Hebron. Years of operation: 1810-1818. Proprietor: Sylvester Gilbert. Number of students: 56. (4) Swift’s Law School, Windham. Years of operation: 1805-1823. Proprietor: Zephaniah Swift. Number of students: 12+ (records incomplete). 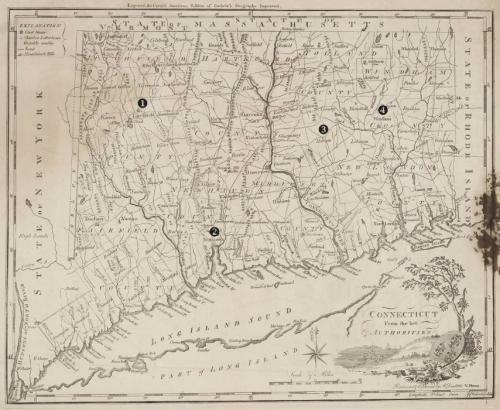 Map: Amos Doolittle & Mathew Carey, “Connecticut From the Best Authorities,” in The general atlas for Carey’s edition of Guthrie’s Geography improved (Philadelphia: Mathew Carey, 1795). Courtesy Beinecke Rare Book and Manuscript Library, Yale University.